“The water’s bright orange,” we exclaim while balancing ourselves precariously on rocks alongside a spring. We are visiting the community of San Sebastian in the province of La Union in the northeast corner of El Salvador. Above us stands a mountain with a prominent slash where U.S. and other firms mined gold for over a century, a mountain that also happens to be a key watershed for this area. “I’ve seen this water also cranberry red and also bright yellow,” our companion responds. But then she quickly adds: “Remember: don’t touch the water. Last time I was here, I slipped and ended up with rashes all over my leg and stomach where I got wet.” She doesn’t need to remind us. Experts from the Salvadoran government’s Ministry of the Environment and Natural Resources were here in July 2012 and they found levels of cyanide and iron that were through the roof. What at first seems odd is that there hasn’t been commercial gold mining here for at least a decade—since the U.S. company Commerce Group left. But, as we learn on this, our second, research trip to El Salvador, a decade or two can be a blink of an eye for the environmental havoc wreaked by gold mining. These ancient mountains contain not only gold and many other minerals, but also sulfide. It is a deadly combination with long-term consequences: once the mining excavations expose sulfide to the air and rain, it is converted to sulfuric acid. With each new rain, the acid unleashes new toxic substances down the mountain and into the springs and streams. In a nutshell: a long-term poisoning of the water, the land, and the people. The now-orange spring water flows into a now-lifeless stream that flows into the San Sebastian river that, in turn, flows into the Santa Rosa river. Along the way, the water is used by many before it enters the Gulf of Fonseca far to the south and continues its journey. We spend the next day with Father Lorenzo, a handsome man in his early forties with an easy, dimpled smile, who is the priest from the nearby city of Santa Rosa de Lima. Father Lorenzo leads us up the mountain to the site where Commerce Group mined. On the way, we walk by homes built on land covered by finely crushed rocks, or “tailings”—what remains when the mining companies use cyanide to separate the gold from the surrounding rock. We walk on roads and paths built from the tailings. Near the top of the mountain, we enter the mines: jagged holes carved into the mountainside, with piles of rock below, here and there a glint suggesting the ore that lies within. It is not hard to figure out where Fr. 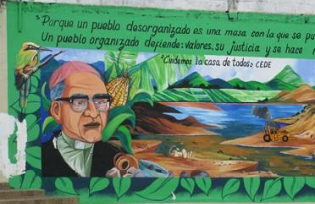 Lorenzo now stands in terms of mining: a dramatic mural outside his church depicts a denuded landscape darkened by mining. But, we ask, how did Father Lorenzo and the community discover that the mountain we are standing on was a toxic nightmare? The environmental nightmare actually goes back to the original miner here, U.S. metallurgist Charles Butters. Butters commercialized the use of cyanide in gold extraction over a century ago. In 1927, Butters was kicked out of nearby Nicaragua by the revolutionary leader Augusto Sandino, but he had already found a much more compliant government in El Salvador. Butters purchased the San Sebastian mine in the early 1900s for $100,000, and within a year had mined $1 million worth of gold—24-carat, we are told. We can’t help but admire Butters’ gold-sourcing skills and the workers’ stamina as we envision him searching for the vein and them hauling ore out of these steep mountains before any roads were built. And thus began the sad saga. The most recent company to extract gold from this mountain was Wisconsin-based Commerce Group, which first acquired the San Sebastian gold mine in 1968. Commerce Group made money off the gold for many years, stopping temporarily during El Salvador’s civil war and ceasing mining activity by 1999 due primarily to the low price of gold. Yet, as gold prices skyrocketed over the past decade, Commerce filed for and was awarded a new mining license from the government. Then, in 2006, a study by the research group CEICOM found that the San Sebastian river was 100,000 times more acidic than uncontaminated bodies of water in the same region—so bad that the Environmental Ministry of El Salvador’s then right-wing government revoked the company’s environmental permit. Rising protests from mining communities and a coalition called the National Roundtable on Mining (“La Mesa”) led the two front-running political parties in the 2009 Salvadoran presidential election to voice opposition to mining. The victor, the current progressive government of Mauricio Funes, has kept its word and not issued any new mining permits since 2009. And so, in 2009, Commerce Group became one of two North American mining firms (the other is Vancouver-based, Pacific Rim) to sue the Salvadoran government in an investor-rights tribunal based at the World Bank in Washington, D.C. That tribunal ruled against Commerce Group in 2011. But Commerce Group appealed the decision in July 2012, demanding $100 million from the government of El Salvador. As we look at the orange water and walk on the cyanide-laced soil, the fact that current global rules allow Commerce Group to sue the Salvadoran government seems beyond ludicrous. Groups in the United States have joined the Roundtable in protests against the firm, demanding that it drop the suit and pay for a clean-up in San Sebastian, whatever it costs and however long it takes. But this tale is not just about El Salvador and the people of San Sebastian. Nor about the need for those of us in the United States to help ensure that a U.S. company pays for the damage it has caused and that gold-mining not return to environmentally-vulnerable El Salvador. And it’s not just about the need to make sure that domestic investment laws and future trade agreements do not include such lopsided investor-rights clauses. With the rise in gold prices, U.S. and Canadian firms are reopening old mines from Michigan to Maine; with the excuse of the economic crisis, mining firms are pressuring state legislatures to loosen environmental regulations. Robin Broad is a Professor of International Development at American University in Washington, D.C. and has worked as an international economist in the U.S. Treasury Department and the U.S. Congress. John Cavanagh is director of the Institute for Policy Studies, and is co-chair (with David Korten) of the New Economy Working Group. They are co-authors of three books and numerous articles on the global economy, and have been traveling the country and the world for their project Local Dreams: Finding Rootedness in the Age of Vulnerability.